Iroquois Springs offers a well-rounded, diverse and exciting program of activities in a safe and supportive environment. Our instructors provide guidance and supervision to help campers find personal success. Campers have the opportunity to participate in a large variety of activities and events they already enjoy, as well as activities they may be attempting for the first time. 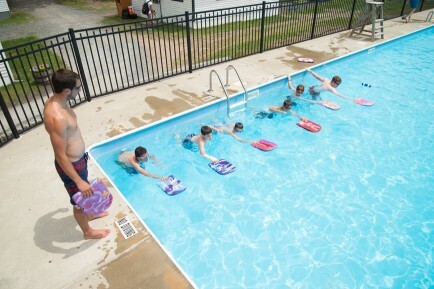 Campers are encouraged to try everything with the support of our hands-on instructors and experienced specialists. The program is set up to help campers develop and improve skills, build confidence and have a whole lot of fun along the way! Iroquois Springs recognizes the importance of both the community experience and personal discovery, by combining a healthy mix of group and individually selected activities. Each day, campers participate in group-centered activities with their bunk, developing and strengthening the personal relationships, and also have the opportunity to choose personal electives and clubs. Having some choice in their schedule gives campers a sense of independence, empowerment and happiness doing what they may want to try for the first time or love most.